A fell refers to a vast, wide landscape without many trees or much vegetation. 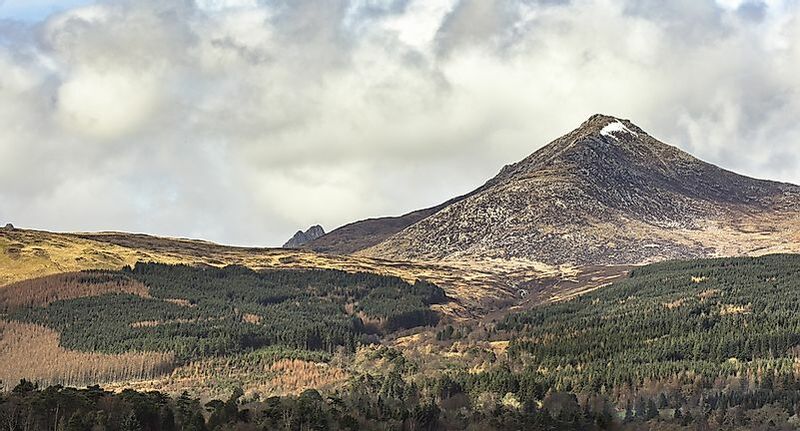 Goat Fell is the highest point of the Isle of Arran in Scotland. A fell is a high altitude landscape feature, usually barren masses of land such as mountain ranges and moor-covered hills. The word fell is mostly used in Fennoscandia, parts of Northern England, Scotland, and the Isle of Man. The term fell has its origin from the Old Norse word ‘fell’ which was used to signify the parts of the mountains that are usually located above the endpoint of the alpine trees. However, the term fell is rarely used. In fact, many people tend to think that its usage is misplaced, outdated or archaic. Many people tend to confuse fells with mountains or hills. In fact, some people refer to hills as fells and fells as hills. As earlier stated, fells are supposed to refer to the unproductive masses of land that are below the mountain ranges or moor-covered hills. However, in certain areas, just the normal regular hills are referred to as fells. For instance, in guidebooks and geographical books, hills and mountains of the Lake District and the Pennine are referred to as Fells. It should be noted that the term is however not used in regular day to day conversations. The word fell is also used in some parts of the world to refer to any uncultivated high ground that is either used as a communal grazing land or is lying fallow. For instance, the Seathwaite Fell is a high altitude mass of land that is used as a common grazing field by the farmers living in Seathwaite. The fellgate is a region that marks the road from a human settlement onto the fell. There are a number of recognizable fells in Scotland, where the term enjoys a little more usage than other places. For instance, there is the Campsie Fell that is located in Central Scotland, a region to the northeastern of Glasgow. The Peel Fell that is situated in the Kielder Forest, on the northern border of Scotland and the English County of Northumberland to the south. The Goat Fell, which is the highest point of the Isle of Arran, is also located in Scotland. What Activities Are Carried out on Fells? As earlier stated, the fells are usually barren. Agricultural activities can rarely take place on the fells except maybe grazing of livestock. They are mostly unproductive because they are rocky. However, there are other activities that are still carried out on the fells. The most popular activity on the fells is fell-walking. Fell-walking is a hiking activity done on the fells. Fell-walking is just the equivalent of hill walking in Great Britain. Besides, the fells are usually a tourist attraction site. Mining can also be carried out on fells. Some of the fells have been found to be rich in minerals. The presence of minerals is probably due to the volcanic activities or due to the process of the formation of the mountain or hills. As they are mostly isolated, grazing of livestock takes on fells. The farmers living around fells use the fells as their common grazing fields for their livestock.